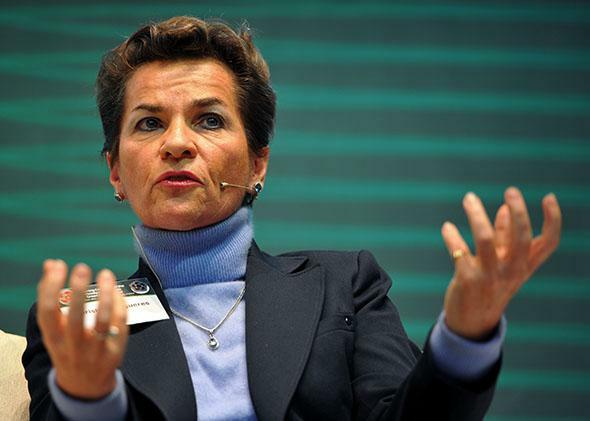 Global climate treaty: U.N.’s Christiana Figueres says we’ll have an agreement in Paris in 2015. The head of the U.N. Convention on Climate Change has one of the world’s most challenging jobs. Christiana Figueres, executive secretary of the UNFCCC. Christiana Figueres is the executive secretary of the U.N. Framework Convention on Climate Change. She has to persuade 194 countries to sign a deal in 2015 that will stop global warming. Catherine Brahic: You’re working to create an international climate change agreement. Where do the negotiations stand? Christiana Figueres: We’re on a straight path toward an agreement in Paris in December 2015. In May 2015 the draft agreement needs to go out to every government. This is not a small contract. This really is the basis for a global transformation the likes of which the world has never seen. But at the same time we have to keep our focus on 2014 as the year when most of the work needs to be done, and when we build people’s confidence that we can move to a low-carbon economy. CB: What has changed since the U.N. climate change summit in Copenhagen in 2009? CF: I think the fundamental problem we had in Copenhagen was a lack of confidence in one another’s ability to do anything. That has changed. Now more than 60 countries have climate legislation. We have a total of 500 climate laws that cover about 90 percent of emissions. There is a sense of “yes, we want to do this,” and perhaps more importantly, “yes, we can do this.” The private sector is doing the same. Investments are beginning to shift. We have $1 trillion in renewable energy. It’s not enough, but it’s moving in the right direction. CB: The 2015 deal will include national pledges to cut emissions by 2020. Will that be enough to keep warming below the limit of 2 degrees Celsius? CF: No. That’s why it’s important that the global treaty sets out how we get to carbon neutrality by the second half of the century. In a perfect world global emissions would have peaked already. In a semi-perfect world we will peak on Dec. 31, 2020. The fact is, that’s going to be difficult. We know that it’s going to get more and more expensive the longer we delay. We will have to invest more, and in more expensive technologies. It’s very much about balance between time and ultimate cost. CB: What technologies should we prioritize? CF: We have most of the technologies that we need. But the price needs to come down. The fact that solar has gone down 80 percent since 2008 is astonishing. Wind is perhaps not coming down as quickly. Lack of storage—batteries—is a bottleneck. That makes it very difficult to put large amounts of renewable energy on the grid. The U.S. military is investing in new storage technology because most of the weight that soldiers carry on their backs is batteries. Once that gets developed for the military, it will be expanded to civilians. The technology that still has a big question mark is carbon capture and storage. It is only with marketable CCS that we will be able to use the fossil fuels that we need. Storage and CCS would be my top two choices for technology investment. CF: Why isn’t it happening fast enough? Obviously, that’s my frustration. But there’s a difference between this global transformation and many others: When we went from the horse and buggy to the internal combustion engine, there was no alarm clock. This transformation is larger than anything we’ve ever done, and an alarm clock is ticking in our faces. CB: Your job is one of the most intractable on the planet. Where do you even begin? CF: Well, first, you can’t get overwhelmed by it. It’s a matter of setting the stage for conversations to occur, building confidence, recognizing progress and continually setting the next milestone. It’s not much different than having children. You can rear them in an antagonistic environment or in a facilitative one with a good combination of love and discipline. It’s about supporting them, and recognizing achievements and contributions, but also saying, “that’s fantastic but it’s not enough, here’s the next thing.” Honestly, what was my best training for this job? Being a mother. CB: Can we really get to carbon neutrality by the second half of the century? CF: Yes. Right now, we’re still pushing the ball uphill. We have to get to the point where each individual, each corporation, each community chooses low carbon, because it makes fundamental sense. It should become a no-brainer. No architect should design buildings that import a huge amount of energy. Each building should produce as least as much energy as it’s going to need, and have more to put on the grid. They should be using all of the natural light and natural heat. We shouldn’t have stupid cars that use liquid fossil fuels. Come on, how outmoded is that? We have to get to the point where this is no longer a part of our experience. You will live to see that. I hope I will also. How old are you? CF: I’m 57. By the time you’re my age, carbon neutrality is going to be so standardized that you will look at anything that is not carbon neutral and go, “where the hell did that monster come from?” It’s exciting. CB: What is your experience of the fossil fuel companies? CF: It’s understandable that they’re having existential panic attacks. It’s not just the exploration platforms they have, it’s the rights they paid for future exploration. At the same time, they understand that we are at this moment in history, and that they’d better get on board because they don’t have an option. I see fossil fuel companies that are investing some of their profits into renewable energy R&D and efficiency. CB: Many people see that as greenwashing. CF: It’s not greenwashing. It’s a new business for them. They’re not touting it, they’re doing it very, very discreetly, because they need to understand what that business is first. These companies can really make a huge difference to the scale, speed, and timing with which we engage in this transformation. Honestly, it is very much in their hands. I am very hopeful that French oil company Total is going to come out with a leadership position this year. CB: You have pointed out that other businesses are already voluntarily making green choices. CF: Apple is a fantastic example. Their CEO Tim Cook was criticized for investing too much in renewables when that is not Apple’s main business. He retorted with something like: “If you’re a shareholder and you don’t like this policy, get out of my shares.” That’s a tipping point. It’s a completely new discussion. CB: Ordinary people seem to be disengaging from the problem, do you worry about that? CF: The fact is, when you talk to people, they know that something weird is going on, particularly people who are connected to the land or the water. They can see it. What perhaps is not so evident to them, unfortunately, is what the solution is. But whether they call it climate change or not, it doesn’t matter. The point is, they can see there’s something fundamentally weird going on here. CB: Some say tackling climate change is utopian. CF: It’s not. Would you have said “utopian speech” to Martin Luther King? When you have a vision of where you need to go, it sounds utopian. But when you get to the tipping point, your understanding switches. We’re going to get to the point where we ask how the hell we put up with high carbon for so many years. You thank your lucky stars, because you are seeing this transformation in your lifetime. You are going to tell your children and your grandchildren you saw this whole thing in front of your eyes.